The quality of both wine and oil rely on a series of surrounding environmental factors that determine how distinctive and valuable the final organic product is. Two liquids. Possibly the most important organic liquids to mankind. One is harvested at considerable cost from deep in the earth and the other from a fruit that grows on the poorest soils on its surface. The second of these retails at a price roughly 700 times that of the other. Water to wine? Well, we would all be a lot richer if we could turn oil into wine! All organic products arguably have a ‘terroir’, i.e. the environmental factors that make the product distinctive. Some require large amounts of energy and nutrients - the need for thick and rich source rocks imply petroleum is in this category - but many foods and drinks produce the best products at the lower limits of their ‘goldilocks’ or ‘golden’ zones with regard to the temperature, light and nutrient ranges at which they survive. Scotland claim to produce better raspberries than those grown in England - and certainly than in Spain, while Scandinavian apples are equally famous. Wine grapes are most definitely in the same category, with it generally being accepted that ‘the grapes need to struggle to produce the best wine’. They need, basically, to have the longest growing season possible to develop the more complex compounds that make up a miniscule proportion of the wine, but give it its distinctive flavour. The grapes should only just achieve what we might call ‘marginal maturity’, otherwise some of these compounds may then break down to sugar and produce less palatable tastes. Perhaps this ‘struggling’ principle is best demonstrated by the Cabernet Sauvignon-dominated terroirs of the left Bordeaux bank of the Gironde in south-west France, where the vines grow on Pleistocene highstand beaches in which no other crop has ever been successfully grown. The quality produced by such slow maturation is thus far more important than the quantity we favour for other organic products. Oil and the complex taste components of the wine are also different from each other because one is the product of breaking down carbon bonds, and the other the product of organic assembly. Klein Constantia vineyard, South Africa. The grapes in the foreground are Muscat and are used to make ‘Vin de Constance’, one of the highest graded dessert wines in the world, favoured by Napoleon and the Queen, amongst others. These grow on an incised valley of eroded material from the Ordovician Table Mountain Quartzite (seen on the mountainside). The upper slopes, which are on average 2oC cooler and overlie granite, are planted mainly with Sauvignon Blanc. Image credit: Duncan Macgregor. Just like oil and gas have distinctive and different ‘ golden zones’ (Nadeau, 2011), so do different grapes. 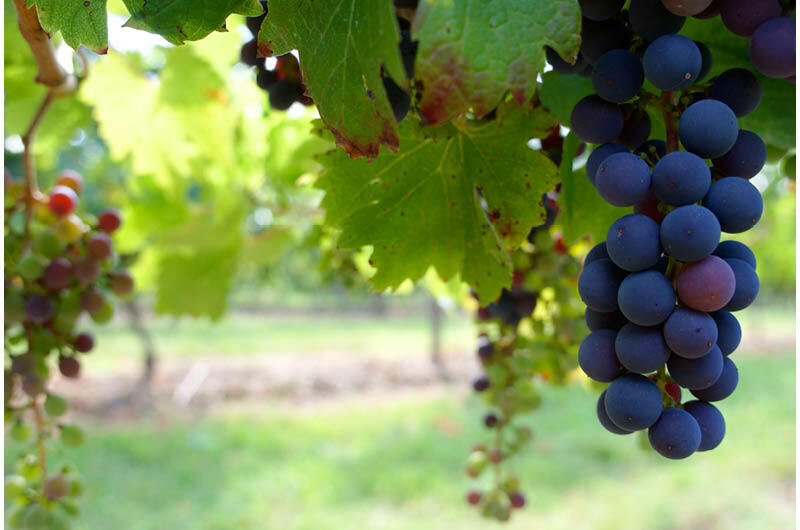 In general, red grapes need more energy and nutrients than white grapes, though there are exceptions such as Pinot Noir, which is also the grape thought to be closest to the natural grape which originated in the Caucasus. To some extent, nutrient and light supply can be balanced against the critical control of temperature, which is often measured as a time-temperature index that would be readily recognised by many geochemists. So northern France and Germany are famous for their whites and southern France, Spain and most of the southern hemisphere most famous for their reds. In a blind test of four grape varieties of equivalent price that I gave my local wine circle, France edged past Australia on the whites but was demolished 26-0 on Shiraz vs Syrah. (Syrah in France is known as Shiraz in Australia but they come from the same grape). This principle is demonstrated in a map of the Klein Constantia vineyard, just south of Table Mountain in South Africa. Because of winds from the coast that swirl round the mountain, there is a temperature gradient of 2oC/100m of altitude across this vineyard. This is coupled with the development of richer soils over Precambrian phyllites towards the base, while the upper cooler vines are characterized by poor sandy soils developed over weathered granite. 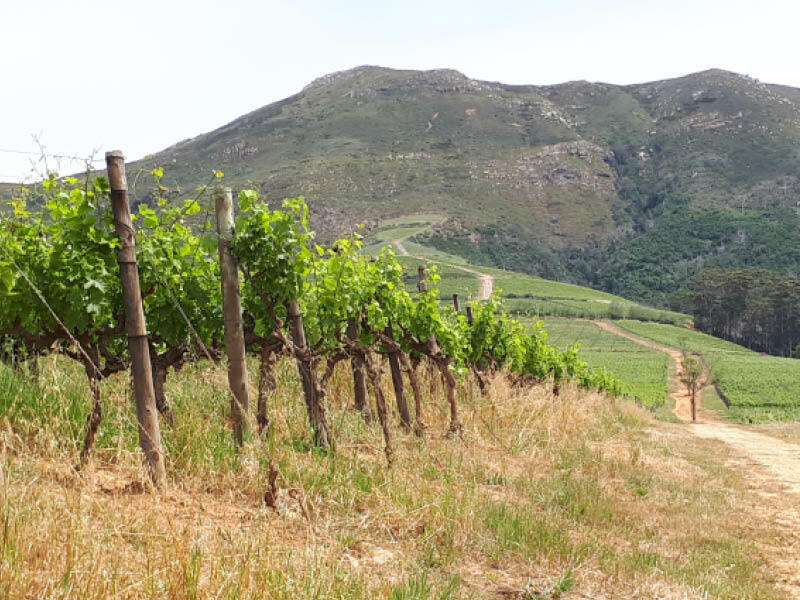 The low ‘time-temperature index’ varietals of Riesling (supposedly the most terroir-expressive grape of all) and Sauvignon Blanc are grown on the high sandy granite soils, while the reds are grown in the warmer microclimates over the richer phyllite soils. 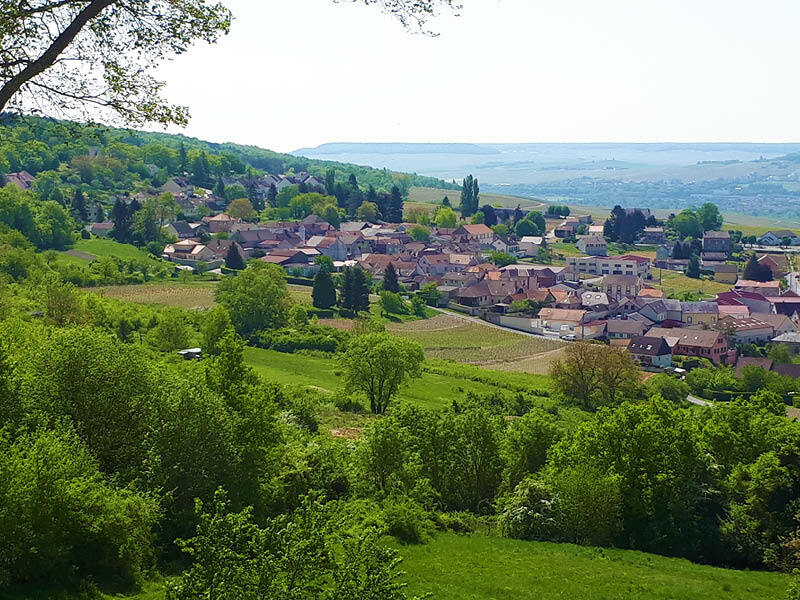 Champagne grapes growing just below the Cretaceous/Tertiary boundary, which forms the top of the slopes and the flat surface of the wooded hills in the distance. Image credit: Duncan Macgregor. So how strong is the geological control on terroir and wine? From the discussions above and as further documented in a number of publications by wine-loving geologists (Wilson, 1998, Huggett, 2005), it is usually indirect. Commonly, it lies in the development of a soil, generally a poor one, that enables the correct balance of nutrients, light and heat for the grape concerned. 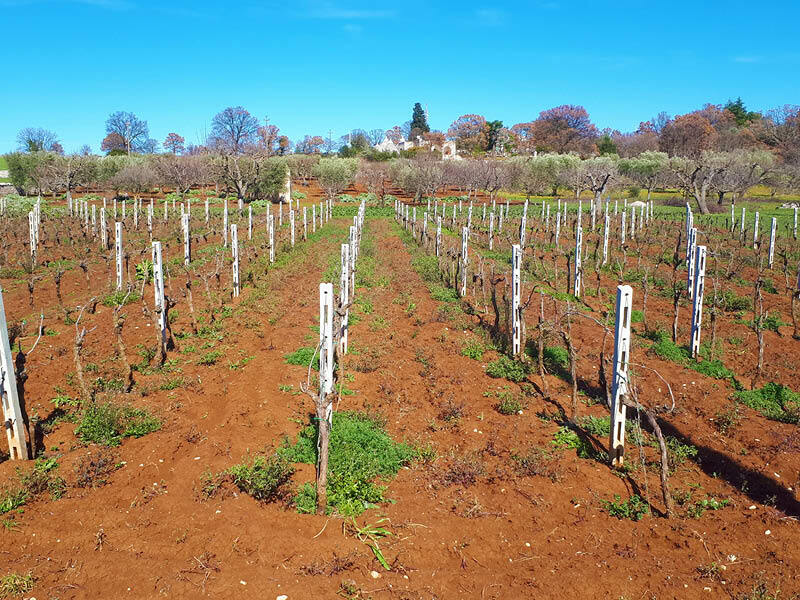 It may also lie in a control on water supply and drainage, as vines are often grown in semi-arid areas with seasonal rainfall, so some water retention in the soil within microporosity will help. However, vines also hate being waterlogged so permeability is required to drain the excess water during the rare heavy rains. Being on a slope helps, particularly the middle part, which is best drained and least subject to frosts. Primitivo grapes growing on ‘Terra Rossa’ soils over limestone in Puglia, Italy. Image credit: Duncan Macgregor. Step forward our great friend, carbonates, with their dual porosity systems: high quality French wines in particular are disproportionately grown on limestone slopes. Champagne grapes are for instance grown on the escarpments of the Upper Chalk, just below the ‘KT’ boundary. The Chalk gives poor soils with a deficiency of iron, not good for the Pinot Noir component in particular, but this is supplemented by iron from Palaeogene lignites which have crept down the slopes. In hotter climates with chemical weathering, limestones form the famous ‘Terra Rossa’, known in particular from Australia, Italy and South Africa. Perhaps the strongest direct association of geology with wine in the world is the Cenozoic limestone that forms a narrow 2-km-wide strip of ‘Terra Rossa’ in the Coonawarra of South Australia, which makes some of the world’s best Cabernet Sauvignon. As soon as the Terra Rossa is lost, no wine is grown (Hancock and Huggett, 2004). From this brief discussion, I think we can say that we can bring many of our petroleum system exploration principles to play in our enjoyment of another liquid that enriches our lives. So when you buy a bottle of wine, ask about the terroir (if nothing else, it makes you sound clever! ), though unless you are at the vineyard, you may just get a blank look. As a geologist, you will soon realise you know (or can pretend to know) a lot more than many self-designated wine experts. You may of course not be convinced by everything I have said here and may feel the need to do some research, and of course ‘scientific sampling’ of your own! Perhaps we then can discuss it – over a glass or two, of course! Duncan Macgregor is a consultant petroleum geologist specialising in regional African exploration and training. He spent 20 years at BP, working largely in the Far East and thereafter has worked and consulted for a number of independent companies and consultancies, mainly on new ventures and play fairway scale studies in Africa. He is currently a trainer, mentor and product auditor at Halliburton/Neftex Petroleum Consultants. The 2016 Energy Institute Awards reflect the diversity of outstanding achievements across the global energy sector. And this year GEO ExPro magazine is one of the Nominees.